With eight Tony Awards to its name, Once (Broadway) is undeniably a hit musical the other side of the Atlantic. Wins in 2012 include best musical, best director and best actor in Steve Kazee, so it’s not surprising that the West End transfer generated a lot of interest. Having opened in the Phoenix Theatre in April 2013, it’s taken me a while to get to see this one, but when I did, I was lucky enough to see the fantastic Arthur Darvill starring as Guy. Adapted from the film of the same name, Once tells a captivating story of a, “Broken Hearted Hoover Fixer Sucker Guy,” in Dublin (and yes, that’s exactly what it sounds like), and a quirky Czech Girl who come together, and ultimately fall apart, through an incredibly intense musical chemistry. The charm of the show is in how unusual it feels, particularly in the West End where we’ve grown accustomed to soaring crescendos, action-packed plots and intricate sets. That’s certainly not to say this is a low-key production. But in Once, we can appreciate the raw talent of the whole, omnipresent cast who, incredibly, create all the music on stage without a conductor, and do it superbly. The brilliance is that it feels so natural, so authentic, and so fitting for a story that confronts the fact that a real life flirtation rarely results in a, “happily ever after,” or a tragic demise as is so often depicted. But it shows us a love that couldn’t develop, but that marked a wonderful, indelible moment in the landscape of the characters’ lives, which leaves them both with a different perspective. I was surprised and delighted by arriving to find the stage doubling as a fully-functioning Irish bar where we were invited to have a drink and listen to live music. But that’s just one of so many traditional theatrical boundaries that are broken down in Once, with spectacular effect. The barely perceptible dimming of the lights to herald the start of the show draws the audience in, and is reinforced by not having a stage curtain or any introductory announcement. Even sat in the Dress Circle it made me feel that I was involved, a part of the show, sat in the pub with the characters and listening to them tell their stories and create music. This level of audience engagement was a revelation, as we emotionally connected with the characters on what felt like a personal level. 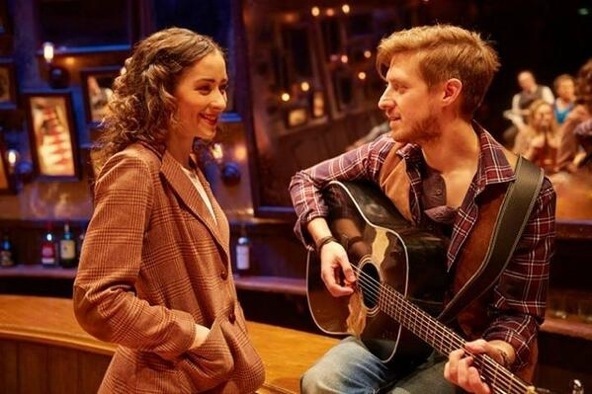 Former Broadway star Arthur Darvill is in the West End production for just 8 weeks, a transience that’s conveyed powerfully in the chemistry that we witness between Darvill and Cvitešić. Their relationship, reflecting that between Guy and Girl, is fresh, exciting, and endearingly awkward, making us root for them in an unparalleled way. It demonstrates that nothing is perfect, and nothing is infinite, but that that can still be incredible. And “incredible” is the only way to describe Darvill’s performance. He sang gorgeously, his voice saturated with unexpressed emotion, the highlight for me being his rendition of “Leave,” which simultaneously washed over me, and cut straight through me. The true star of the show, and the linchpin holding it together was the sensational Zrinka Cvitešić as Girl. She has since been awarded an Olivier for her performance, and it’s clear to see why. Night after night, a theatre full of people are falling in love with her; her charisma, her charm, her quirky mannerisms, not to mention her beautiful voice and talent as a pianist. There’s something that feels amazingly organic about her performances as a real woman with real obligations, as well as equally real desires. She was so utterly convincing that I found myself time and time again thinking, “I wish I were more like that,” just because of the way she makes her character brighten the others around her, seemingly illuminating only their positive attributes. Cvitešić moves both the characters and the audience, as Girl behaves with dignity and integrity. Because of this, I cried through the end of the show, for Girl, for Guy, and for myself, as the production made the mirrors on the walls of the Irish pub reflect my personality and experiences back at me. 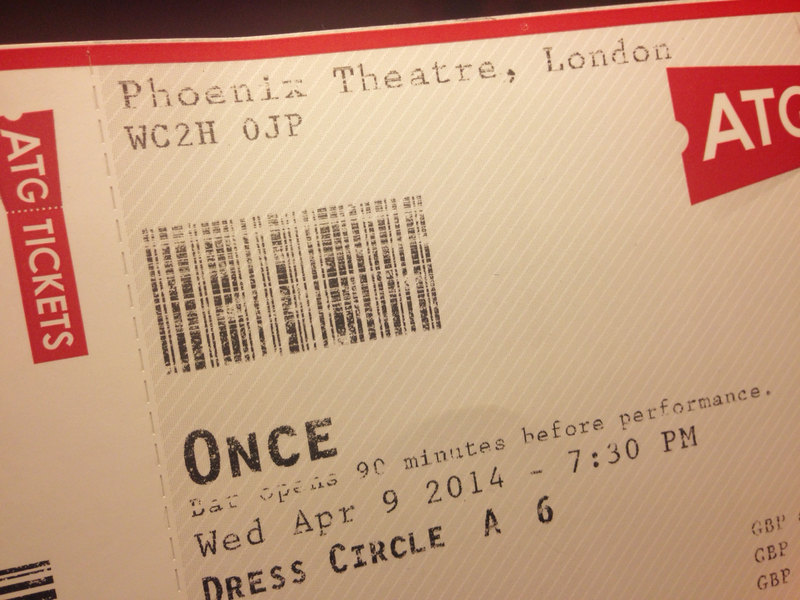 And that’s why Once is wonderful; it’s unrefined and it’s unusual, but it’s provoking, compelling and absolutely, fantastically unique.